Trouble is stalking Marina. She’s already escaped the clutches of her formidable foe once, but fate has even more trials in store for her. There are evil plans in the works– plans that threaten both her and her newly found family. As she struggles to come to grips with her unwanted powers, outside forces threaten to tear Marina and Ethan apart, making her doubt their vision of an idyllic future together. Can first love be true love? I have really enjoyed the Marina's Tales series, loving its humor, sweet love story, light-heartedness, and plot twists. As far as main characters go, Marina is not one of my favorites. I like Marina for her loyalty to her friends and family, and to the mermaids. I don't like her stubbornness and tendency to make bad decisions. She keeps secrets from her boyfriend, Ethan, secrets which ultimately put her life in jeopardy. And she takes a long time to learn her lesson about that, but she finally does. That growth is what kept me from really disliking her as a character. Marina is a mermaid-human hybrid who has muse powers: she enhances the talents and emotions of everyone around her. I think that is such an interesting power, and it is neat to read about her effects on those around her. For example, her cousin Cruz is a budding designer, and because Marina wants him to succeed, great things start happening for him and his career. Marina's power as a muse is what eventually gets her in trouble, though. Other people know about this power, and are intent on capturing it for themselves. The other threat is to Marina's mermaid family. People want to capture the secret of immortality for themselves, and want to use the mermaids to experiment on. Marina and Ethan's relationship is also in peril. They are at odds for part of the book and I almost thought they were going to be done for good a couple of times. 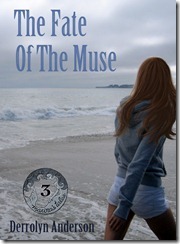 Overall, I enjoyed The Fate of the Muse. The plot had more layers than the first two books, which I loved, and the ending sets things up perfectly for book four, the final book in the series. If you like reading about mermaids, you'll love this series. If you like reading contemporary YA, you'll also like it. The Marina's Tales series has a little bit of everything, and I'm looking forward to seeing how it all ends in The Turning Tides.